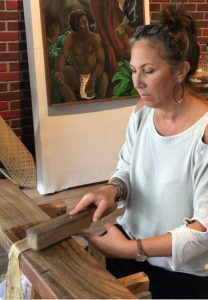 Page Chang, a Native Hawaiian artist, teacher, and kapa maker, will talk about her work with bioplastics as well as her experiments with natural materials such as wauke and hemp during a discussion scheduled for 2 to 3:20 p.m., Wednesday, Nov. 7. UH West Oʻahu’s Distinguished Visiting Scholar Committee is sponsoring Chang’s talk in the ʻUluʻulu Exhibit Space in the James & Abigail Campbell Library. Chang’s artwork ranges from paintings to textiles to plastics, and incorporates traditional Hawaiian and modern motifs. Chang, was born and raised in the suburbs of Washington, D.C., and was passionate about learning Hawaiian cultural practices when she moved to Hawaiʻi 24 years ago. Chang looks to the ʻāina and the renewable resources found here in Hawaiʻi as a means of solving the ecological and social emergencies faced locally and as a global community. She recently received the Award of Excellence at the “Annual Hawaiʻi Craftsmen Juried Exhibit” for a kapa malo. According to her Pūko‘a Studios’ website, Chang looks to inspire visitors and non-natives to have a deeper understanding and respect for the culture that results in a desire to protect it. She also tries to paint familiar scenes of her life in Waimānalo and the traditions of contemporary Hawai‘i while sharing stories of her own Hawaiian family and those passed down through chant and mele. She also seeks to challenge Hawaiian stereotypes by striving to replace them with authentic images. Chang notes her newest passion is Hawaiian kapa along with Native Hawaiian and other natural dyes. She has worked with Kumu Dalani Tanahy, to learn to grow, harvest, process, and dye kapa, as well as make all of the tools that she needs. Tanahy, a noted kapa-maker from Mākaha, this year is serving as the inaugural Master Kumu for UH West Oʻahu’s Hawaiian-Pacific Studies program. Tagged bioplastics, Dalani Tanahy, Distinguished Visiting Scholar Committee, Kapa, Page Chang, The University of Hawaiʻi-West Oʻahu, www. Bookmark the permalink.